I read the Daily Mail On-Line because there's not much detail past the headlines, and there's usually plenty of pictures showing women in heels. They tend to celebs at film Premières, 'Award ceremonies etc etc. They are a bit right wing, so I stay away from the Politics section. If I needed to explain further, it's how I got to include the photo's of Abbey Crouch, shown elsewhere. So, spotted some outfits today, I thought worthy to include here, together with a 4 or 5 word reason. Please leave comments!! Christina Milian (singer apparently) ...... Platforms but stylish look. Kelly Brook. Glamorous actress, best known for the glamour. Likes to wear a heel when in front of the camera. And these are 'properly' high heels. Loubies. I'm seriously impressed. Both celebs displaying very good taste when it cones to their choice of outfit! Kelly Brook always looks the part in front of a camera, particularly like the Christina Millian boots though.... Wouldnt mind a pair myself! Very very very big "Yessssss." I think Victoria Beckham has spent her entire adult life walking tip-toe. A true high heel lifer. Agreed. Her and Kylie Minogue. She must have dressed in the dark? Outfit is a big "NO!" Lovely example of Louboutin Pigalle, but stripes and checks together? Nope! Samantha Barks ...... Big, BIG yessss!! Went out with a girlfriend some 20+ years ago in a similar ensemble. (She even more slender, as hard as it is for me to comprehend the possibility. Though photo's help keep the memory alive. ) Why did we split? She couldn't wear a heel at all. (Duh! ) Or maybe she wouldn't, as she was already 2 or 3 inches taller than me. I still see her from time to time. Still has a cracking figure. Legs up to her armpits. My loss. Can we count in male celebs as well? 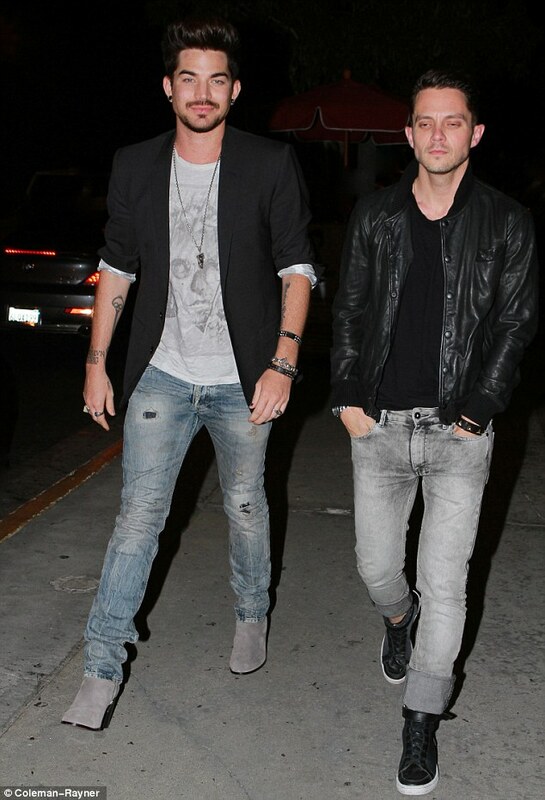 Adam Lambert is known to wear heels in regular basis. I usually like his style, specially like his style in the attached picture. A very good looking fellow. This is Lawrence Washington, aka "Miss Lawrence". A hairdresser to the the celebrities, from Atlanta, Georgia here in the U.S. . A free spirit who doesn't really subscribe to either gender, he is always in heels, and rocks some great boots much of the time. He possesses a courage in the public eye that is inspiring to me. He certainly wears those boots well. Was the irony that he was wearing heels, but the photo doesn't show the heels? Sure he has on pointed shoes, but I couldn't see a heel. Is >> this << where he picked up the taste for them? Another. 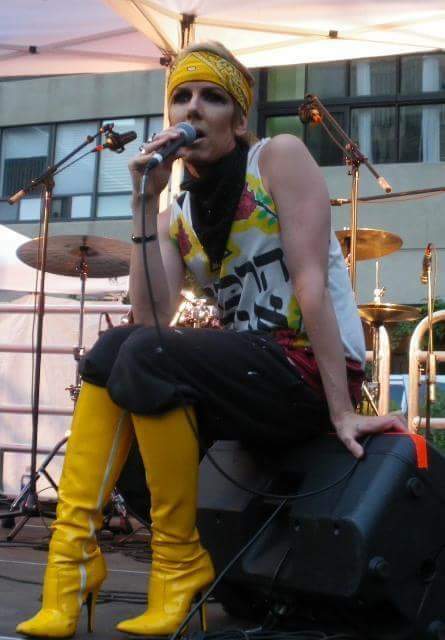 Canadian punk musician-DJ Plastik Patrik. 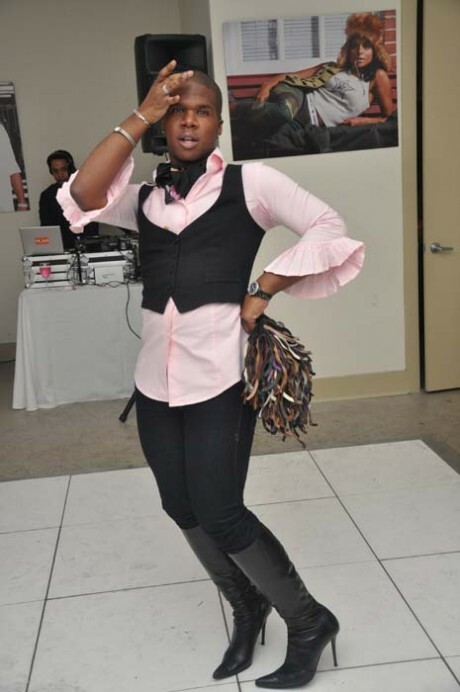 This guy always performs in very high heeled stiletto boots, and maintains an androgynous vibe most of the time. Even when not performing, he wears heels in public. None of that works for me, I'm afraid. Not my thing at all. True - high heels, and tall boots, for that matter, with or without heels, are definitely associated with feminine fashions. But a change of footwear, on its own, does not create an androgynous look, let alone drift into cross dressing. You are both walking into "blue trees" territory. You can call them any colour you like, but when the rest of the world calls them green, they're green. With that second picture, the only thing that's outwardly feminine, is the shoes. Shorts, tee-shirt, bob (bowl) hair cut - male. Okay, eye-liner not usually seen on men, as long as you forget Marc Bolan, Duran Duran and others. In my world, wearing footwear specifically designed for women, is cross-dressing, although you North Americans have a peculiar way of associating it with TV activity and male prostitution which is almost unheard of over here in the UK. Some years ago I enraged a high heel wearer in HHp for saying the same thing. Some people don't like and some don't tolerate well, this truth. It's all very well our small clique of men into wearing heels saying/suggesting it's completely 'normal' (as it is to us). The sad fact is, this isn't considered normal by most other people, and they wouldn't even concede to it being androgyny or cross-dressing: we'd be classed as TV's or "gay's". For me there are no barriers to clothing styles. In my little bubble, folk can wear whatever they want, there's no such thing as men or women's clothing. That said, there's no style excuse for dressing badly. I don't understand men with beards wearing makeup. I don't understand large people (men or women) wearing inappropriate clothing for their size. That usually means trying to disguise a large frame, with an even larger outfit.... While skinny people doing the same is a significantly less common occurrence, wearing oversize clothing doesn't suits anyone. Not only do I want - as an ideal - desexualised clothing (completely androgynous), I support it. As far as that goes, one of my very few regrets, is that I didn't have the courage of my convictions when young enough and slim enough to get away with it as a style statement. Closer to the end of my life than the start, I am too late to "change the world". And as I've also mentioned before, had I taken that course in the 1980's, I would have died some years ago. The excesses of the 80's and 90's produced a very unhealthy environment for those in the 'art' and entertainment fields. I'm sure I would have succumbed, as so many did. Grammar + two more paragraphs.